Ironically, both movies have also also been quite delayed and now we see why. “Jupiter Ascending” opened two days ago after initially being slated to open in July 2014. That film’s push back was justified to finish its extensive special effects, which “The Matrix” creators did without remembering to fix its laughable acting and weak story. 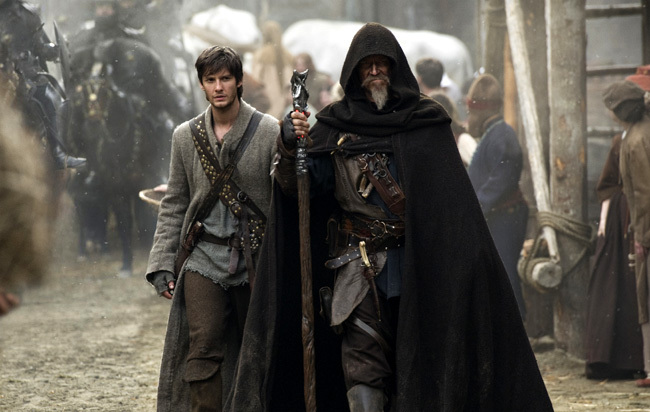 Tom Ward (Ben Barnes, left) is trained by Master Gregory (Jeff Bridges) in “Seventh Son”. Also knowing it was in trouble, “Seventh Son” was originally supposed to open way back in Feb. 2013, but the film was pushed back once and then a second time to Feb. 2015. It even changed distribution hands from Warner Bros. to Universal. While the film got amplified to IMAX status, even that huge-screen format can’t make large a film that only captures a small imprint. Though there were some reasons to be stoked for “Seventh Son,” including the reunion of Jeff Bridges and Julianne Moore for the first time since “The Big Lebowski,” the film is fighting an uphill battle due to a weak fan base. With his awkwardly guttural deep voice, Bridges plays Master Gregory: the mentor to his new apprentice Thomas (Ben Barnes from “The Chronicles of Narnia” films and 2009’s “Dorian Gray”). Like the old man, Thomas is en route to become a Spook and wage war against evil magical witches and other dark creatures. Alicia Vikander is Alice, a half-witch spy who falls for Tom, in “Seventh Son”. Bridges last played this kind of character in 2014’s mega flop “R.I.P.D.”. And the 2010 Nicolas Cage fantasy film “The Sorcerer’s Apprentice,” which features a similar story, also didn’t hit a home run. While those memories might prove to be telltale predictions for the film’s struggle, most of all “Seventh Son” is battling a quiet fan base. Joseph Delaney’s books are nowhere as prevalent as “The Hunger Games” and “Twilight” novels and films, so people deciding to take a chance on the “seventh son of the seventh son” are more leery to do so. Many just won’t. In its opening weekend, “Seventh Son” placed fourth at the domestic box office with only $7.1 million. That figure falls far behind the newly released “Jupiter Ascending” ($19 million), “American Sniper” ($24.1 million, which is in release for 6.6 weeks now) and the newly released weekend box-office king “The SpongeBob Movie: Sponge Out of Water” ($56 million). Julianne Moore is the witch queen Mother Malkin in “Seventh Son”. It should be noted, though, that “Seventh Son” is doing much better overseas at this point with a $83.6 million foreign box-office capture. While “Seventh Son” offers some satisfying eye candy thanks to its special effects department, it’s easily forgettable as brave new CGI worlds aren’t explored. But where the film disappoints the most is in its attempt to form emotional bonds. All led by Julianne Moore as the powerful witch leader Mother Malkin, “Seventh Son” quickly sets up its team of villains. They include an underutilized Oscar-nominated Djimon Hounsou (“Gladiator”) with his chains and warlock blades, a dude with four arms and lots of swords and some other ones that I don’t remember and neither will you. 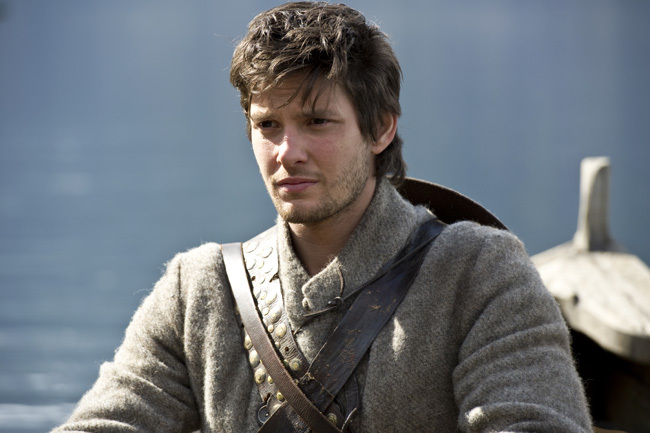 Ben Barnes is Tom Ward, a simple farmhand torn from his family to embark upon an adventure, in “Seventh Son”. In her brief screen time, Olivia Williams as Mam Ward (Tom’s mom) actually outshines him. While Jeff Bridges and Julianne Moore are there to satisfy the “A”-list need with Ben Barnes sprinkled in to serve the handsome Taylor Lautner effect, the only interesting and memorable character is Alicia Vikander as the half-witch daughter of Mother Malkin’s sister (Antje Traue as Bony Lizzie). Having been seen in “Anna Karenina,” Vikander as Alice is an initially devious trickster who falls in love with Ben Barnes as Tom Ward. Her loyalty to the witches is tested in conflict with her quick love for Tom as a witch killer. While I’m not blown away by their chemistry as a young-love couple, Vikander’s performance by itself is the one I remember most from this otherwise snooze of a film. Though the source material isn’t focused on Alice, to save this train wreck of a film I would have started by centering it on her rather than Master Gregory and his relationship with Tom against the big bad Mother Malkin. Djimon Hounsou is Radu, a blade-wielding warlock who transforms into a raging creature of darkness, in “Seventh Son”. Light on substance, “Seventh Son” ultimately squanders a promising cast with unfocused and incoherent story decisions, unusual-but-not-in-a-good-way acting, unfortunate choices with gender roles and one-sided depiction of people with color. “Seventh Son” stars Ben Barnes, Julianne Moore, Jeff Bridges, Djimon Hounsou, Alicia Vikander, Olivia Williams and Jason Scott Lee from director Sergey Bodrov and writers Charles Leavitt and Steven Knight based on the book series “The Last Apprentice” by Joseph Delaney. The film, which has a running time of 102 minutes and opened on Feb. 6, 2015, is rated “PG-13” for intense fantasy violence and action throughout, frightening images and brief strong language.